Learn the Brachial plexus reconstruction (intercostal to radial nerve transfer) surgical technique with step by step instructions on OrthOracle. Our e-learning platform contains high resolution images and a certified CME of the Brachial plexus reconstruction (intercostal to radial nerve transfer) surgical procedure. The intercostal nerves provide a source of axons that may be used for neurotisation in a variety of situations. The most common indication is in brachial plexus reconstruction where a pre-ganglionic injury has precluded direct nerve repair. In the most severe grades of brachial plexus injury, donor nerve options for use in neurotisation are limited. 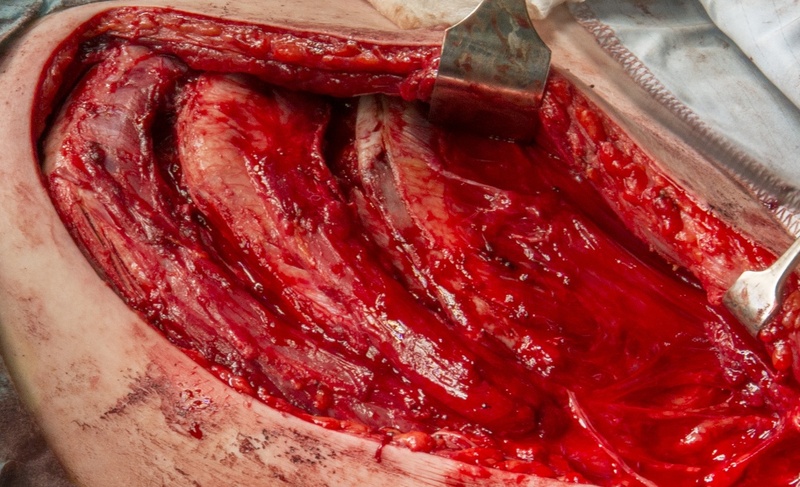 Often intra-plexal donors are not available and one must decide upon a reconstructive strategy that makes best use of a limited number of extra-plexal donor nerves to reanimate specific muscle groups. Seddon originally described intercostal nerve transfer to the musculocutaneous nerve using an interposition sural nerve graft. Results improved once technique of direct coaptation without graft was devised. Over recent decades the intercostal nerves, despite their individually low axon population have gained increasing popularity as useful donors, due to their proximity to potential recipients, their propensity for being combined together as dictated by the recipient, and the acceptable donor morbidity. Typically they may be transferred into the musculocutaneous nerve to restore elbow flexion, into the radial nerve to restore elbow extension, or into a free functioning muscle transfer that may in turn drive elbow or hand motors or a composite of the two. Intercostal nerve transfer has also been described for reanimation of the diaphragm in phrenic nerve palsy, reanimation of the contralateral latissimus dorsi in Polands syndrome, and innervation of a rectus femoris muscle transfer in abdominal wall reconstruction. It’s sensory rami may also be used for a sensory nerve transfer, for example to the median nerve in a panplexus injury. This section describes one particular technique for harvesting intercostal nerves and there are significant variations in method between surgeons. It is important to note that this procedure may constitute one component of reconstruction for a patient with brachial plexus injury. The reconstructive strategy as a whole should be devised with the patients goals and functional expectations in mind as well as a realistic idea of what may be feasibly achieved within a reasonable timeframe. This is best performed in a unit that sees large volumes of such injuries and has the facility to provide multidisciplinary team discussion and evaluation.